We might be called The Pin Factory, but we create a lot more than just enamel pins and badges. We produce a massive range of completely custom made metal products, all designed exactly to your requirements by our team of in house graphic personnel, we guarantee Australia's most competitive service, price and turnaround times all without sacrificing quality. Don't waste your time on old fashioned and outdated companies that require you to provide them your completed design along with inflated prices and long delivery times. We guarantee to impress so put us to the test today! We have a whole team of designers who specialise in designing and ensuring your metal products are produced exactly as per your requirements, each and every member of our team are equipped with years of experience in the production and execution of physical marketing products such as our custom metal products, lapel pins, medals, cufflinks and other high end corporate gifts like bespoke metal plaques and challenge coins. Using our design service ensures you receive the best possible design for your company, and you get to view and provide feedback on the design prior to spending a single cent! Once approved we produce your items and deliver directly to your door. We are a unique wholesale manufacturer. We produce die struck metal products for the promotional industry. We have fine-tuned their process and service to the point where they can offer factory direct prices without the need for customers to order excess units of a single product. Every marketer worth their salt knows that high-quality custom promotional products are one of the most effective and economical ways of getting a brand out and about. The Pin Factory has absolute control over quality. We oversee every step of the production process from design to final manufacture and delivery. Our products have to pass strict quality checks prior to leaving the factory. The customer does not have to pay a cent until complete satisfaction is achieved. From the creation of the idea, to designs and mock up, The Pin Factory is with the customer every step of the way. It is important that the logo design is simple with bold lines. It is also good to step away from the design board occasionally and look at the logo with fresh eyes to ensure that it looks like what you intend it to look like. There have been scandalous and hilarious outcomes of logos gone wrong in the past. One of the most notable ones in recent years was the London Olympics 2012 logo which in some places caused an uproar. Various factions, both political and religious, saw different “hidden” messages in the logo, and there was much of a hullabaloo. 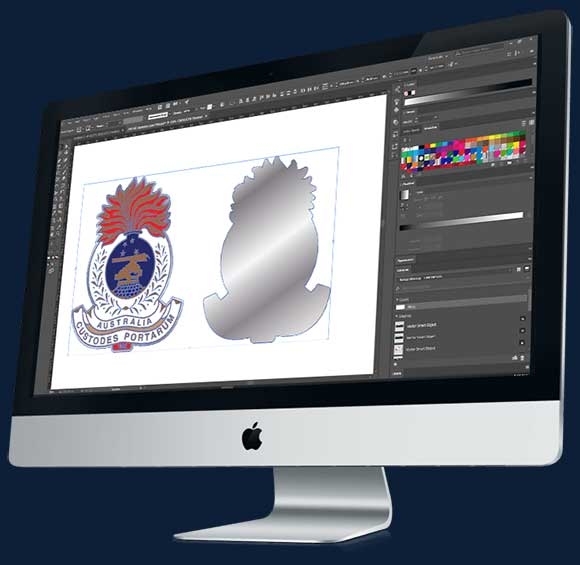 The Pin Factory allows each customer’s entire design process to be free, so several changes can be made until the exact, customised product is created that is clear in its message, purpose and design. We produce many types of custom promotional products. From key rings, to medals, coins, button badges, pins, dog tags, and more, The Pin Factory is a quality custom products producer. 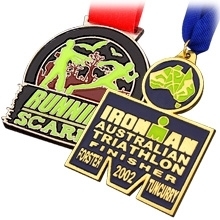 For example, we can manufacture high quality custom medals for any occasion. Medals are usually bestowed as an award for extraordinarily good actions; although these days, they are sometimes used as mementos as well. Medals have been popular throughout the ages. Custom metal products such as medals are a valuable asset to promotional marketing because of their sentimental effect. They are long lasting because they usually end up being displayed in a home or office and are therefore less likely to be thrown away. The Pin Factory's cast metal awards and mementos are produced using enamel colour finishing and printing can be done on both sides. We can also produce unique custom shapes. Sizes start from just under two inches up to six inches. The finishes available are Gold, Silver and Bronze with an antique or polished touch. For customers wishing to create medals for events The Pin Factory can also provide neck ribbon accessories. Sports medallions are another fantastic option as the medallions can incorporate both team logos and information about their highest accolades. 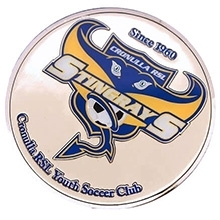 Sponsors can have the added bonus of being able to stamp their brand or logo on a double-sided medallion. Besides these types, production also includes enamel ink filled medals, raised and polished medals, plain etched medals, epoxy dome medals and commemorative coins. The design team is so confident that a quality creation can be produced, that if customers find a lower price on an identically designed medal, they will match the price. Besides custom products such as medals, the company produces custom made button badges. Button badges are also excellent tools for promotional give-aways. We can be produced on a mass scale, they are simple to customise and are supremely visible after distribution. Button badges are steeped in history as far as the 1890s, where they were used for political publicity. Apparently, United States president Abraham Lincoln was the first politician to use button badges with his image printed on them. He would distribute them to only a certain amount of backers as it was expensive to create button badges in those days. Today, button badges are much more cost effective with just as much impact from a marketing point of view. As with most logo and brand designs, simplicity is key when it comes to custom-designing your button badge. Bright colours and simple fonts stand out and make it easy for people to observe from a distance. Do not be afraid to work and rework on your brand or logo. Besides avoiding hiccups, simplifying your design can result in greater reachability. The Spotify logo is a good example of this. If you google their previous design with the current design, you will see how keeping it simple makes something stand out, and present a more true ethos of a brand. With Spotify the simple logo suggests that using their music player app will be simple too. Customising the right button badge takes some thought and consideration. Think of what your logo stands for and customise according to your target audience. Colours are matched to the Pantone standard which is a propriety colour space used predominantly in printing. By standardising the colours, different manufacturers in various locations can all refer to the Pantone system without having to make direct contact with one another to ensure that the colours precisely match. Another custom made product available is the lapel pin. 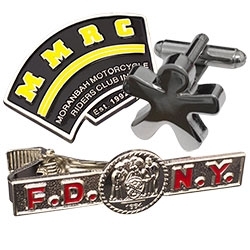 Lapel pins can be used to express membership, and of course, propel brand recognition. 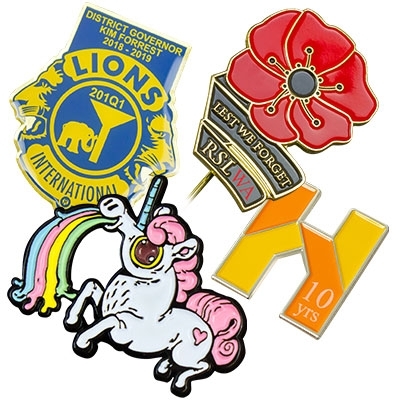 There are several types to choose from before customisation: there are die struck pins, soft and hard enamel pins, die cast pins and printed finish pins. Enamel pins come in two types, soft and hard. 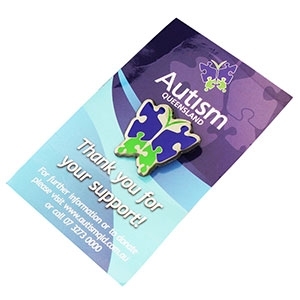 The soft enamel pins are most effective and gives off a three-dimensional effect. The recessed areas of the pin are coloured using enamel paint. Hard enamel pins are produced in a similar way except that heat is applied during the hardening process. This leaves a smooth finish to the end product, and while this process makes hard enamel pins more expensive, many customers choose this finish when it comes to special occasions or gifts. Die struck pins are made by striking a die of the client's custom design onto a sheet of thin metal. This stamped metal can then be customised with silver or gold plate. There is also the choice of sandblasting for extra visual effect. Die cast pins are created by utilising a custom made mould of the design. Hot metal is then poured into the mould. Much more intricate designs and complex custom shapes can be produced accurately, but it does make the process more involved which raises the price. Printed finish pins, unlike die cast and die struck pins, has no metal line between the colours. However when it comes to customisation, this method is invaluable for the more difficult-to-replicate brands and logos. When you refer to the dictionary, the word “customise” is a verb and it means to modify or build according to individual or personal specifications or preference. The world has been creating custom made products for many years and when it comes to marketing there is nothing that expresses a personal ethos or image more than customisation. Historically, a printer from Ohio, USA, called Jasper Meek is considered to be the originator of the customisation industry. He convinced a local shoe store to supply book bags imprinted with the store name to local schools. A competitor picked up on the idea, and soon the two were selling custom business products such as printed fans, marble bags, calendars, aprons and even hats for horses. The UK promotional merchandise industry became more sophisticated in the 1950s. There was no recognised industry before then, although some companies did provide occasional gifts. The real growth started in the seventies when many corporate companies started to recognise the value gained from promoting their brands with the use of gifts bearing their logo. The Australasian Promotional Products Association (APPA) has conducted research to show the benefit of the promotional merchandise industry in Australia and New Zealand. According to APPA the effectiveness of promotional merchandise is demonstrated by their research which shows that 52% of recipients of promotional merchandise say their impression of a company is more positive after receiving custom made promotional products, 76% recall the name advertised on the product, 55% keep the item for more than one year, nearly 50% of recipients use them daily and 52% of people do business with a company after receiving custom marketing products. This explains why we have so many items available that can be customised with logos and brands. 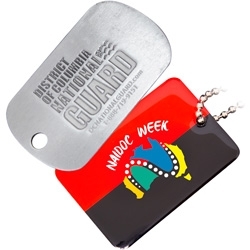 Other interesting promo-items they produce are dog tags. Whether they are a give-away item or for actual critical identification, dog tags are another valuable item worthy of consideration. Another often overlooked promotional product is the trolley coin. It is an item that is used daily in shopping centres and supermarkets, and many people have experienced the annoyance of not having a coin to hand to release their shopping trolley. 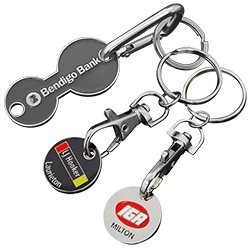 Branded trolley coins attached to key rings can remedy this common problem and promote the logo at the same time. There are several ways of customising the trolley coin. Polished moulded coins have raised branding adding a tactile element which is handy when you are fishing through your bag in a hurry. The finishes range from shiny gold to antique brass, one of which is bound to complement the logo. When it comes to enhancing custom logo products, there is a simple elegant approach to coin customisation and that is the stamped enamel-filled coins which contrast the sheen of polished metal with the logo. Photo-etched enamel trolley coins adds more colour, while the screen printed epoxy dome coatings allow for even more detail, which has proved to be a popular choice. The coatings include a silk-screened image that is protected by a resilient layer of acrylic and is permanently fastened to the token. Meanwhile, full colour epoxy dome printing “ups the ante” further by allowing just about any branding to be accurately reproduced, even at small scales. The durable acrylic epoxy ensures that the image will remain protected and therefore be long lasting. 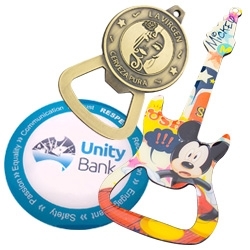 Another custom made promotional product that gives more bang for your buck is the humble but effective key ring that goes hand in hand with the trolley coin. There are a variety of stunning, durable styles and finishes. The clip style key rings allow the coin to be removed from an integrated snap hook whenever it is needed. Once the trolley has been returned to the shop, the token can be released and snapped back onto the keyring with ease. For those with their hands full, the holder-equipped key ring allows the coin to be easily slid out or back in as needed with only one hand free required. 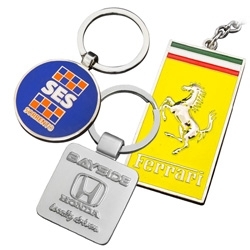 A popular style among corporate companies is the two sided coin key ring. They fulfil a double task with each side of the included token mimicking a coin of a different denomination. This in turn opens up more space for branding. Speaking of branding, check out the website for custom products online and personalised wear. We sell great items that you can customise such as corporate cuff links, custom branded tie clips and bars, and custom belt buckles.